What top-secret cataclysm did Project Rising Spirit unleash years ago on Atlee, Nevada? And what role did the nanite-enhanced commando known as Bloodshot play in scratching an entire city off the map? With his false memories now wiped away, Bloodshot and the PRS escapee codenamed Pulse are about to bring one hell of a reckoning to the black ops butchers that made them into walking weapons. But will the truth that lies beneath Atlee leave Bloodshot bloodied – or with blood on his hands? 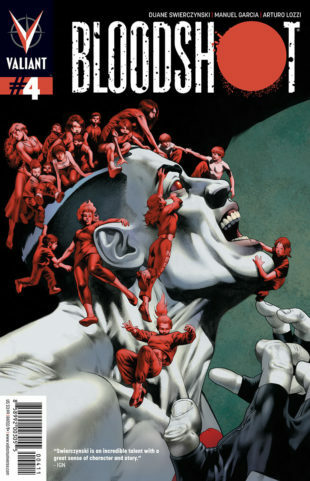 The book that Newsarama calls a “solid suspense comic” with a “lightning-fast pace” hurdles toward the brain-rattling climax of its first campaign into the darkest reaches of the Valiant Universe on October 10th in Bloodshot #4! And go inside the process that revamped and rebuilt the Valiant heroes for a new generation with the Bloodshot #4 Character Design Cover – featuring exclusive Bloodshot art and concept designs by superstar artist David Aja (Hawkeye, Immortal Iron Fist)!